With fall just a few days off (even though I officially embraced this autumnal season a few weeks ago), I realized that I never fully shared my summer with you. 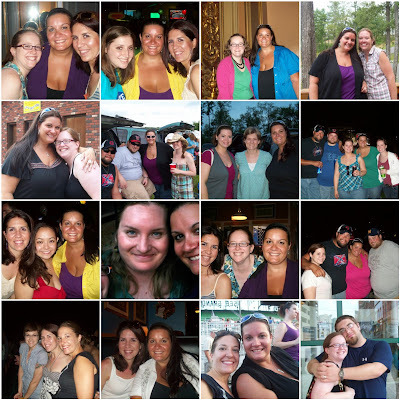 I selfishly thought I could declare another "Summer of Me" and that it would be as enlightening as last summer. As May kicked off, I quickly realized that summer was going to be morphing into something a bit different, something much bigger than the "Summer of Me." This past season took me to places I never though I'd visit and returned me to places from my past. This summer is going into the books as the "Summer of Friends," both old and new, near and far. There were concerts (NINE in all!) with friends where we tailgated for hours and danced under the stars. There was a weekend with college friends remembering some of favorite memories from college and making plans for the future. There was a visit to an ice cream factory with Randi. A road trip to DC to visit with Nora, Becky, Amanda and Ally confirming that blog friends and real life friends are one in the same. A visit locally when Becky and her husband drove through my little valley en route to another destination. A road trip to Deep Creek, MD to finally spend the day with one of my very best blog friends Jen where my cousin and I met her family. There were shopping excursions into Pittsburgh with my younger cousins that included a side visit to one of my best college friends to see her adorable twin daughters. A trip to Columbus to see the musical Wicked with my mom, a close family friend, and Victoria (who made the drive from Indianapolis). A long weekend in Minneapolis with Lisa, Nora, and Kyla left me feeling incredibly blessed and lucky to have found such amazing friendships through this blog. Laughter. Tears. Heartache. Endings. New beginnings. Road trips. Brunches. New cities. College towns. Gchats. Phone calls. Emails. Snail mails. Late nights. Early mornings. Coffee shops. Concerts. Slumber parties. Cabin retreats. Lunches. Strengthening bonds. Shortening distances. Closing gaps. Smiles. Love. Memories. A summer I won't soon forget. Thank you, friends, all of you, for being a part of my summer!